A list of ports and docks once policed by BTP or constituent forces (Please get in touch if you can add any further information). Dates, where known, show the earliest and latest record of officers stationed at the post. London A PC Walter Titmuss is shown as being based here in 1913. Located on the south bank of the Thames. Lancashire 1921 - 1973 Last regular Officer Jack Maddocks retired circa 1975 and it was covered from Heysham Harbour on an as required basis. An officer used to travel daily from Heysham to Barrow, mainly for rail work. London 1901-1932. Officers based here include PC Arthur Chamberlain and PC Charles Rice. Lancashire From Heysham we covered the Lake Windermere Steamers and the three Piers at Lakeside, Bowness and Ambleside. Bill Rogerson was based here for a couple of years. Gloucestershire Uncertain if officers were ever actually stationed at the dock there. Covered on an as required basis from Newport Docks in the 1970s (Source VH/KCC). LOWESTOFT, Suffolk But did we police the port or just the railway station? Devon PC Terence Jordan was based here in 1985. SILLOTH DOCKS, Cumbria 1941 - 1949 I believe we stopped policing this dock around in 1964. SOUTHAMPTON DOCKS, Hampshire 1840 - 1985 Once a Division of the Force. WEYMOUTH HARBOUR There were no police stationed at Weymouth Quay. From at least 07.06.1880 Police stationed at Weymouth Town railway station escorted trains from the station to the quay that ran over public roads. And policed the GWR owned passenger steamers that ran from Weymouth to continental ports. In the late 1970s/early 1980s, officers often performed duties in uniform on the quayside in Cherbourg. Weymouth BTP police post closed on 01.03.1987 and its officers were relocated to Bournemouth. See StoryBank. BUTE DOCKS, Cardiff Oct 1858 - 13.04.1985 Four large docks. 127 years unbroken police service. Police withdrawn 1985, still a working commercial port (2010). BARRY DOCKS, Vale of Glamorgan 10.07.1889 - April 1985 Built and owned by the Barry Dock & Railway Company. Police withdrawn 1985, still a working commercial port (2010). Vale of Glamorgan 10.06.1865 - 1950s Built and owned by the Taff Vale Railway Company until 1923. Closed commercially in 1936. Re-opened for duration of the 2WW. A police post until the 1950s then covered from Cardiff on an as required basis. Still a working commercial port albeit as a yacht marina today (2010). Pembrokeshire 1926 - 1985 Police withdrawn 1985, still a working passenger port (2010). Anglesey 1920s - 1985 Police withdrawn 1985, still a working passenger port (2010). 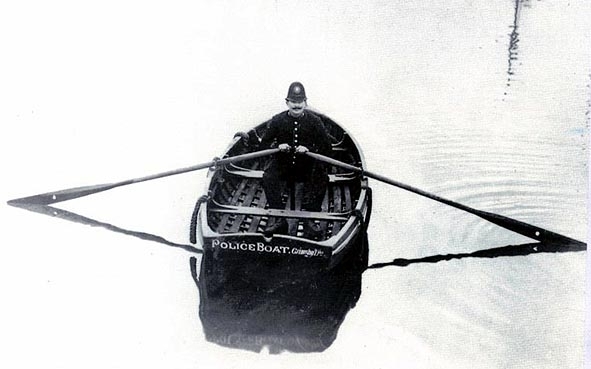 Gwent 1873 - 1985 Built and owned by the Alexander Dock & Railway Company, Newport until 1923. Police withdrawn 1985, still a working commercial port (2010). Glamorgan 1936 - 1985 Built by the Port Talbot Dock Company in 1837. No confirmation of early policing before 1936 although there almost certainly was. Police withdrawn 1985, still a working commercial port (2010). Glamorgan 1852 - April 1985 Built and owned by the Swansea Harbour Trust until 1923. Police withdrawn 1985, still a working commercial port (2010). AYR Harbour PC Robert Frew was based here from 1943 - 1945 so presumably just a wartime posting. GRANGEMOUTH DOCKS 1940 - 1977 I believe that this was a private dock but Policed by BTP on contract. METHIL DOCKS Dates of the police post are unknown, but the docks were under railway company / nationalised ownership between 1889 and 1963. PC George Clark served there from 1939 until his retirement in 1962. ROTHSAEY DOCKS On the River Clyde. TROON HARBOUR 1943 - 1945 PC Homer Taylor was based here during the War. BELFAST DONEGAL QUAY Police there until around 1978/79 (KG went there to collect the radio equipment when the post closed). DUBLIN NORTH WALL North Wall Dock was built in 1860. Records of officers here 1902 - 1946. Listed in the Police Almanac of 1902. Police withdrawn around 1964. DUN LAOGHAIRE Police withdrawn around 1964.